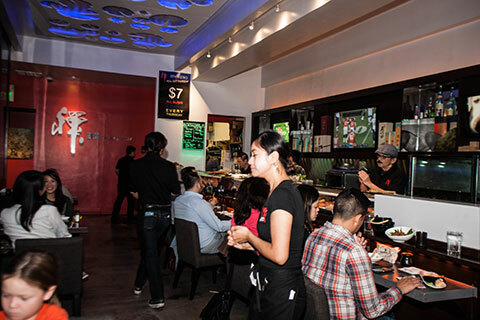 Zen Sushi Bistro – Millbrae is a refreshingly new chic restaurant that offers a casual dining experience in a hip and classy environment. The head chef, Sano, offers a diverse menu of Japanese cuisine at a reasonable price, including a variety of creative and tasty sushi, donburi, udon, and sukiyaki. A great place to gather with friends, listen to music, and sample the after hour’s menu or huge selection of sake. Whether it be the excellent food or the innovative ambiance, Zen Bistro brings a new era dining and lounge experience to Millbrae designed to satisfy a wide range of customers. At Zen Sushi Bistro, we strongly believe in the fundamental principles of Japanese culinary tradition. We use only the freshest seasonal ingredients to create food which is bold in its simplicity. Nothing is overcooked; there are only degrees of rawness. It is a way of preparation which respects what we eat, keeps it close to its natural essence, and awakens our senses. Enjoy the sudden freshness of traditional Japanese cuisine in our modern, delightfully swanky atmosphere – we know you’ll love it.